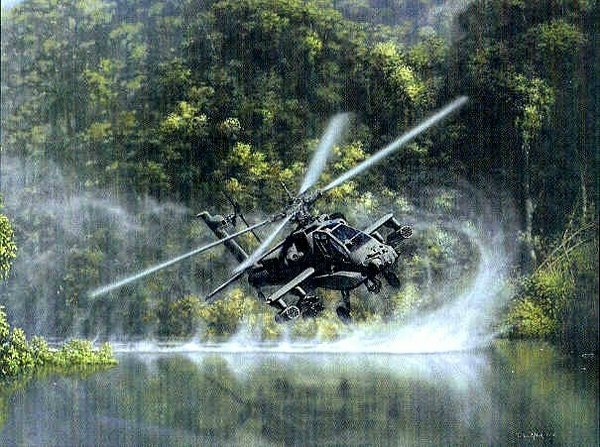 flies low level above a river in Vietnam on the way to yet another brave rescue. Reproduced on 100 lb. Quintescence Archival Stock, each print of "Deliverance" is individually inspected and signed by the artist. Also available as an unsigned 11x14 print for $40. "Deliverance" is also available as a Giclée (pronounced "zhee-clay'), which refers to a 7-color print which utilizes the latest in digital technology to reproduce art with breathtaking accuracy. This is the largest and most expensive version of our print line, usually measuring an overall 42" inches wide, and printed on museum quality Hahnemuhle paper for $495. A near perfect replica of the original painting, Giclée prints are limited to only 50 examples of each image, and are created for the most discriminating collectors.